When Ahmad al-Abboud brought his wife and five children to the United States from war-torn Syria, he carried with him a vision of this country — of scantily clad people kissing in the streets — he feared would clash with his conservative Muslim culture. 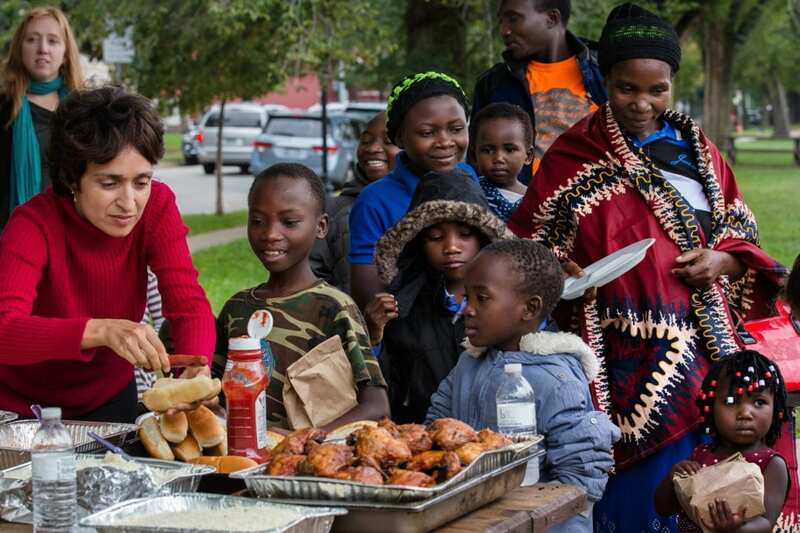 But what he found upon settling in Kansas City in April was a kind, welcoming community, like the one at the picnic he attended Saturday at The Concourse Park at St. John Avenue and Benton Boulevard in Kansas City. The event was meant to incorporate people like al-Abboud into the community, said Sophia Khan, founder of KC for Refugees, the organization that put on the picnic. The day was part of her efforts to introduce refugees to Kansas Citians. Through KC for Refugees, she also works to dispel any fear of refugees. Khan encourages area youth to get involved in refugee settlement efforts. The local chapter of Muslim Youth of North America had a small picnic last year with the refugees, and the chapter helped organize this one as well. “Whatever work we do, it has to be holding hands with our youth so it continues on to the next generation,” she said. Middle schoolers from Pembroke Hill’s Justice Club brought supplies and activities to the picnic. Their efforts included having a bake sale to raise funds for the event; bringing goodie bags for the refugee children; having a clothing drive; and purchasing soccer balls to give to the children. Eleven-year-old Marlena Smith enjoyed making the young children feel welcome and watching them smile while playing with the bubbles and trying on shoes the students had brought for them. Jiya Singh, also 11, said the children lit up when they received soccer balls and began kicking them around at the picnic. They don’t have to speak each other’s languages to get along and play together, she said. KC for Refugees is an interfaith group, and others assisting with the picnic include members of St. Andrew’s Church, Oasis (an atheist organization) and The Temple, Congregation B’nai Jehudah. —Tammy Worth is a freelance journalist based in Blue Springs, Missouri. Find more stories like this on FlatlandKC.org.